Avian Skeletal System. Image from Feisty Feathers website. Over the course of millions of years, birds have evolved a particularly unique skeletal system among the animal world. Naturally, much of the difference between mammalian and avian skeletal systems arises due to most birds’ capability of flight. Granted, flight is a highly advanced evolutionary adaptation; however, birds sacrifice a good deal to achieve it. The major adaptations regarding flight in the avian skeletal system are pneumatic bone structure, elongated necks, small skulls, modified ribs, and a serious degree of rigidity. Many bones in the avian skeletal system are fused into single ossifications, such as the “Pope’s nose” or pygostyle at the birds’ posterior. The fusion of bones in the skeletal system provides a heightened degree of rigidity to the birds’ skeleton, providing for some uniquely awkward biomechanics, particularly whilst on the ground. Rigidity is just as important in engineered flight as it is in avian flight. Most of the earliest attempts at mechanical flight tried to mimic the complex motions of avian flight; however, fixed wing structure and a different means of propulsion has been proven as a much simpler way to achieve lift. There are very few moveable parts on the exterior of an airplane. The fusion of bones and a modified rib structure seem to be natures answer to the need for rigidity in powered flight. The major drawback of all this rigidity is that most birds are horrible at maneuvering on land. They can certainly get from points ‘a’ to ‘b’, but at a heavy loss in dexterity. The pneumatic bone structure of birds refers to their porous nature. Mammalian bones are mostly solid, with a hollow section in the middle for bone marrow. Certain avian bones are instead nearly hollow, with the inside filled with an arrangement of trusses and struts of thin bone to provide some structural support. These pneumatic bones have evolved for two reasons: facilitating their unique respiratory system and reducing weight. Flight requires a higher rate of metabolism, which in turn requires a more efficient gas exchange in breathing. The avian respiratory system has a number of unique adaptations, including a constant supply of “fresh” oxygen rich carbon dioxide pure air. None of which would be possible if it were not for their porous bones. Cleary, porous bones a requisite for this adaptation. As far as reducing weight is concerned, it seems that nature has run into the same issue as engineers on a daily basis. For example, when designing a Formula One car, every gram counts, which is why you will never see a hood ornament on a racecar. In the case of a bird, less weight translates into less energy spent flying. Interestingly enough, the pneumatic bone adaptation carries over to flightless birds. Finally the elongated necks and small heads have important physical and biological implications with regards to flight. The elongated necks in most birds allow for adjustments in the center of gravity mid-flight. Since the moment of inertia is a function of center of mass, the ability to adjust that center helps in maneuvering, as seen in the gecko videos shown in class. As far as the size of their heads, birds have proportionally smaller heads regarding their bodies than do mammals. This adaptation makes flight a bit less awkward, and reduces weight further. In addition, birds have beaks rather than a traditional mandible with teeth. This adaptation reduces weight, yet again, but makes eating a bit more crude than it is for most animals. Everything is swallowed whole, no chewing. As far as I am concerned, flight and all these other drawbacks associated with it seem to be a fair trade. 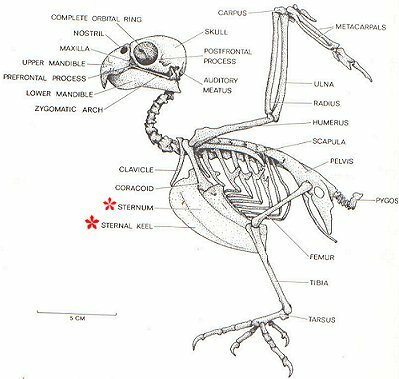 This is a very well done post about the avian skeletal system, and its relation to flight. You also connected it well with other aspects of birds’ anatomy and evolution. I embedded the figures you had linked, to make the post more eye-catching.